The Bryant Lady Hornets soccer team makes its 2010 season debut under new head coach Julie Long on Friday evening at 5 o’clock against the Benton Lady Panthers at C.W. Lewis Stadium. Long, a native of West Plains, Mo., played soccer at Harding University and coached both the boys and girls teams at Nettleton in 2009. 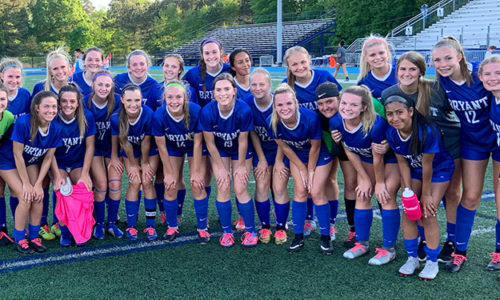 Bryant is coming off a 12-9 season, which included a trip to the Class 7A State Tournament where they suffered a heartbreaking 2-1 loss to a Fort Smith Southside team that wound up making it to the semifinals. McKenzie Adams, one of those freshmen, along with sophomore London Abernathy are expected to join the team after basketball season as well. On the backline, she continued, will include Tarra Hendricks, Sarenity Gomez, Emily Smith, and Lindsay Brazil. Jessica Baugh will come in off the bench to help. At midfield, Katie Moore has been injured but will be cleared to play after March 1. Maggie Hart, Lexi Balisterri and Lauren Reed will play there as well. Erica Selig will also see a lot of playing time. Those include freshman Shelby Gartrell, Madison Land and Bailey Gartrell. The team also includes Ashlen Baughtman, Bailey Schlesier, Kaitlin Gaiser, Kristen Tipton, Taylor Bryant, Jessica Alyiffe, Lauren Boyer, Lizzy White, and Sarah Cockerham. Though new to the 7A-Central Conference, Long is well aware of its strength. The Lady Hornets’ home opener is against Texarkana on Thursday, Feb. 25.